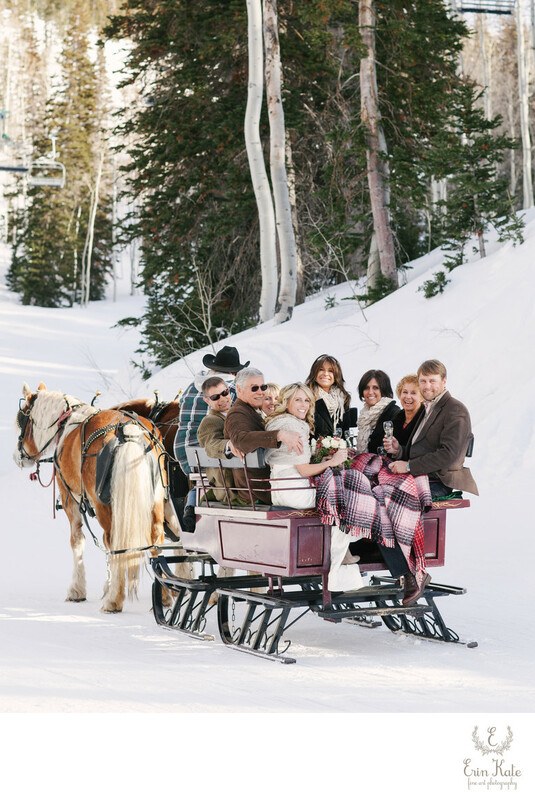 Trish and Noel were married at the Empire Lodge at Deer Valley, Utah. They love the outdoors and the Utah mountains. Trish, Noel, and their guests traveled from North Carolina for their destination nuptials. Their ceremony was set on the snowy ski run with pine trees filling the view behind them. Their wedding guests included Trish's twin sister and her two best friends, and Noel's parent's and brother. They skyped the ceremony with Trish's parents who weren't able to make the trip to Utah. Immediately after the couple said their "i do's" everyone sipped champagne and shared their good wishes for Trish and Noel. This is one of my favorite photographs from this intimate wedding. Everyone took a horse drawn sleigh-ride up the mountain before the sun set. It was cozy and quiet and magical. As the moon appeared above the trees everyone gathered inside the lodge by the fire for dinner. Some of my favorite weddings are the small ones. They can be very relaxed and personal almost like an intimate dinner party. Trisha and Noel wanted that feel for their celebration. The bride wore a lovely gown, knitted shawl, and tall suede leather boots. The groom wore jeans, a red and white gingham button down flannel shirt, and a wool blazer. It was perfectly winter casual. Location: 9200 Marsac Ave, Park City, UT 84060.